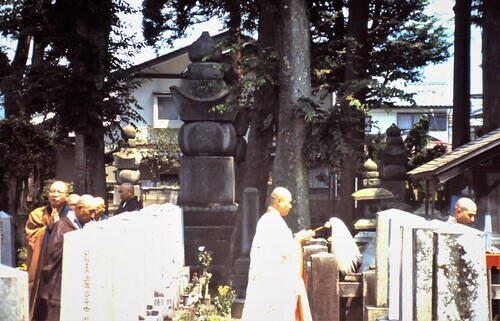 Annual memorial ceremony at the Zen temple once favored by the nine generations of Honda-family rulers who are memorialized here. The rows of uniform tombstones in the foreground belong to WWII era individuals (most people who die are incorporated in family-group tombstones rather than individual markers like these military-issue ones). September 1994 from 35 mm slides scanned in 12/2018.